At Phillips Charitable Foundation we are focused on problem-solving that leads to long-term solutions. It’s our way of maximizing the benefits of our limited grant dollars. For this reason, we’ve chosen workforce development as one of our 2019 mission-focused funding priorities. We’re excited and pleased to announce that Bello Machre received our kick-off grant for this workforce development series. 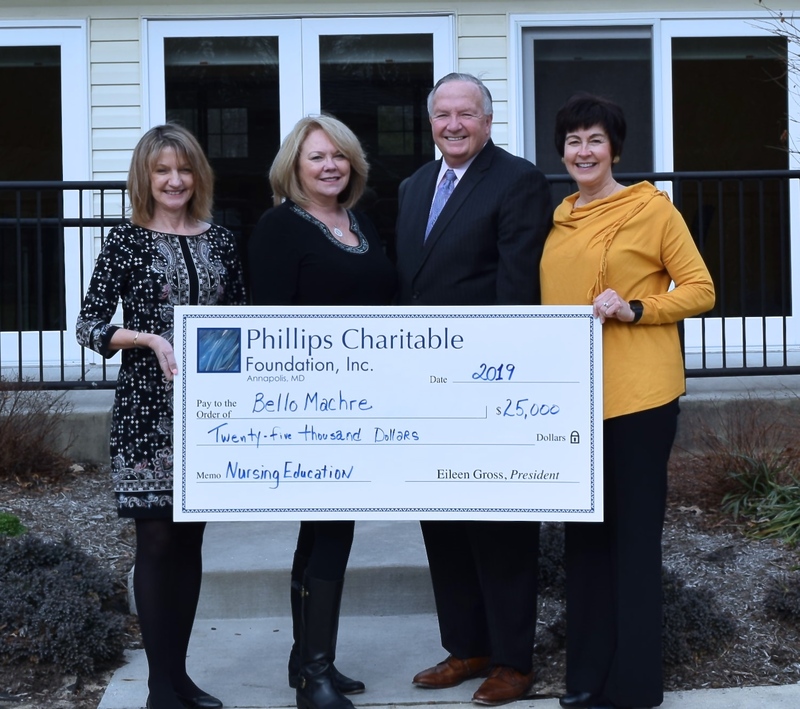 A $25,000 grant was awarded to Bello Machre for their Certified Nursing Assistant Training Program. Bello Machre provides a lifetime commitment of loving care for children and adults with developmental disabilities. They support over 200 people in their 60 community homes and help more than 100 children, adults, and families in their own homes and communities. Services are provided in Central and Western Maryland. The Certified Nursing Assistant Program creates measurable improvements in the prosperity, health, and vitality of people with developmental disabilities and also to Bello Machre employees. After completion of the program, direct care professionals are able to better detect and identify potential medical problems and concerns with the people under their care. They also benefit personally from the skilled nursing training which will lead to a more defined career path. We saw this as a win-win opportunity and are excited to play a small part in the great work being done at Bello Machre. Going forward, we’re interested in workforce development programs that help the most vulnerable and underserved acquire the skills and credentials they need to attain meaningful, family-sustaining jobs with promising career paths. Graduation from quality training programs can completely change the trajectory for an individual and his or her entire family. In fact, it can have multi-generational benefits. We’re carefully researching programs within our giving areas, learning how services are marketed and how students are screened for success. We’re interested in graduation or completion rates and rates of employment after one year. Programs that offer skill development and needed credentials within growing industries with promising career ladders and family-sustaining wages are preferred. Phillips Charitable Foundation carefully curates and selects prospective grantees. However, we also accept Letters of Introduction (LOI) if you believe that your nonprofit has a program that may fit within this or another one of our giving areas. To learn more about Bello Machre go to BelloMachre.org. PrevDo Indirect Costs Directly Impact Services and Your Mission?